If you’re up on the recent olive oil scandals, you may have heard that extra virgin olive oil (EVOO) has lost it’s virginity, so to speak. Many, many, many brands of EVOO have been caught lacing their products with GMO oils, especially the imported brands. You don’t have to be a rocket scientist to understand why. These companies are profit driven; they’re concerned with making more money, not putting out a nourishing and delicious product. Our community votes with their dollars, and it’s time we turned our sites on olive oil. We have had many diyNatural community members ask about a solid (semi-local) source for pure, unadulterated olive oil. We’re happy to report we’ve found THE source – and they’ve generously offered to give away TWO GALLONS of pure olive oil to one lucky diyNatural community member! Chaffin Family Orchards, located in northern California, is a fifth generation family farm dedicated to sustainable farming. The 2,000 acres of unique farmland has been cultivated to produce food of superb quality, without the use of toxic chemicals. During a visit to the farm you might see goats pruning the olive trees, chickens fertilizing the farm as they roam, and cattle mowing the orchards. Not only does Chaffin produce award-winning oil from their olives, they also produce a variety of fruit, and even grass-fed meats. 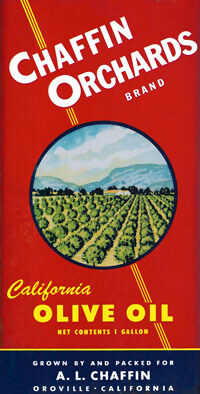 Chaffin Orchard’s Extra Virgin Mission Olive Oil is cold-pressed and unfiltered. The olives come from nearly 100-year-old Mission olive trees. This endangered variety produces some of the best oil, with complex but balanced flavors. Oil from Chaffin olives regularly wins high honors and gold medals at international olive oil competitions. They harvest the majority of their olives for oil late in the season (when the fruit has turned black) which produces a very mild buttery flavor. This late season oil is excellent for daily use in salad dressings, marinades, sautéing, making mayonnaise, etc. They also do a mid-season harvest where a small percentage of the fruit is still green. This produces an oil with a bit more depth and a bold peppery finish. Many people are accustomed to a stronger oil and prefer the spicy notes to balance the oil. Chaffin’s hand-harvested, heirloom olives produce an oil of superb quality that is in high demand. Their oil is currently sold out, so in preparation for this winter’s harvest, Chaffin is offering “olive oil futures.” Purchasing olive oil futures means that you pay a discounted rate in advance and receive your oil (on your doorstep) when the olives are pressed – around February. Right now you can also take advantage of buying futures in bulk for an even steeper discount, which is perfect for buying clubs and groups of friends. All you need to do is purchase at least 10 gallons and place your order by November 30th. Update: This giveaway is over. Chaffin will be giving away gave away 2 gallons of Extra Virgin Mission Olive Oil to one lucky diyNatural reader!. The winner chose between 2 gallons of their late-harvest oil (with a mild buttery flavor), mid-season oil (with a bold peppery flavor), or one gallon of each. The oil will be shipped at the end of the season when pressing is complete (February 2013). This generous giveaway was valued at $120 (and includes free shipping)! The winner was selected at random and announced on Monday, November 12th. Order your Chaffin Olive Ol Futures now before they run out! I would love to win try this olive oil. Great giveaway! I would love to try this olive oil! I cook with olive oil every day and this sounds amazing! I switched to olive oil for all my cooking and I love that it has health benefits for me and my family. 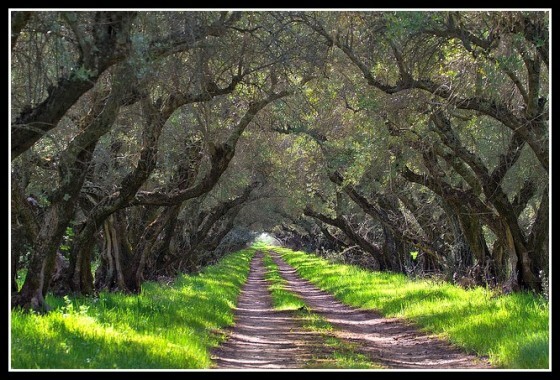 I would love to taste pure unadulterated olive oil made right here in the United States. Hope I’m the winner so I can get that chance. Thanks. I have been studying about aromatherapy and essential oils…winning this Olive Oil would be wonderful!!!! I definitely need a good, quality carrier oil to get started with. I’m so sad, but not surprised, as I have been finding olive oil cheaper than ever, i should’ve figured it was too good to be true. I Pin’ed the give away. Are the giveaways not valid for residents from Puerto Rico? Please stop demonizing the profit motive. Buy the oil you want, but stop complaining about companies that have to make money to pay people and shareholders. You want to rail on something? Investigate govt control of what’s organic, and the money there. The most corrupt systems in the world are not private companies, they’re govt. Thank you for offering the olive give away it would be great to have original extra virgin olive oil and gain from it s benefits. Having celiac spruce and finding safe gluten free foods this is a plus for me. I cook with olive oil all the time now. This would be a great addition to my kitchen! I would spread the word if I win this great gift! I liked and plussed and pinned and tweeted! Also signed up for the Farm news but the sign up box on the right was not working so I used the left side sign up for the newsletter. And for your wonderful site! Signed up for the drawing, (sure hope I win), liked it on face book and DIY, but didn’t the other two, because I am not on them. Thanks for all that you do, the recipes that you share with us. I enjoy reading everything that comes with your logo. We would love to win this wonderful olive oil to use in our family run natural homemade soap business. My youngest 5 boys and I are working hard to help others understand the benefits of using natural products for people and the planet. Thanks!! Wonderful to hear that there are places to buy American! As we strive for less adulterated food, I am happy to learn of this olive orchard and oil pressing facility right here in America. Whomever wins this will indeed be blessed. I use olive oil for everything! Cooking, cleaning and beauty. I would love to win this olive oil. Not only would it be a privilege to try this award-winning product, but I am overjoyed to share information about this great sustainable business. Thanks for this giveaway. Crossing my fingers to win!!! I know Marissa, we do too. Unfortunately we can’t control that part… the companies offering the giveaways have policies on shipping. Blessings. Nice product, I would love to try it. Would love to taste real olive oil, not that stuff they pass off as olive oil on this coast. Snow and slush falling from the sky right now. Some of that olive oil would taste good! Thank you for the promotion and a chance to taste of that green nectar from the other coast! I would love to win some really good oil because I know it is way better than what I have been using. Hi, this sounds like wonderful olive oil. thank you for the opportunity to win. Thanks for the info, it is so scary knowing that a food as simple as pressed olives can be ruined in the hands of the wrong people. I belong to a buying club, and trying to get them to take advantage of their Buying Club deal! Signed up for their newsletter, already signed up for the DIY newsletter and shared on FB. Thanks for sharing this article – I had no idea that GMO’s were being snuck into olive oil. 🙁 It’s shameful how little we can trust companies these days and how little the FDA (run by Monsanto) does about it. The US is really behind the times when it comes to food!! Thanks for keeping us informed! Ok got the link to take me where I needed to go – YAY for USA Olive Oil! I had no idea my imported olive oil had additives. Time to make some changes. Thanks for the info. After I signed up for giveaway, went to their site and the tour video made me want to be younger and be able to start a farm as such. Sent info to my daughter, imagine all that good food! Shame prop 37 was defeated, but then more should be concerned. The more we share this the more people will understand it is not all good out there. And shop locally for your food. Support locally those who are trying to grow organically, non GMO. We all would be healthier and would defeat the health plan, illnesses, and save the land. I’m a DIY follower as well. Did everything but Pin it (not on Pinterest). OTOH, I DID throw in a G+ instead…. This is a great opportunity. Thanks for offering it. I didn’t realize that the olive oil I’m currently using (from a health food store) could contain GMO’s. Frustrating! I entered the give away but don’t see the widget or how to get to it. Would love to win though. Thanks for the offer. The widget is the “Giveaway box” right below “Step Two:” – try reloading the page. I would love to win this too, but there is no link . I went on my own and signed up for newsletter. Is this only for the West Coast? The link is there Linda – below where it says “Step One:” – try reloading the page. Loved reading about the farm and plan on visiting. Would love to win their olive oil. One of each please! LOL. I use olive for all my cooking, it’s disappointing to find out that I am using what I thought was a healthy oil. I recently realized that we have probably been using adulterated olive oil for a long time, all the while thinking we were protecting ourselves from harmful oils. I put our most recent purchase in the fridge and it clouded up, but clouding tells me nothing about the quality of the olives used. Thank you for finding Chaffin Farm and spreading the word. Thanks to Chaffin Farm for carrying on the tradition and for not trying to cut corners or deceive customers. I would love to win this give-away. I always cook with olive oil and am looking for more “home grown” US sources of this valuable cooking resource! What an amazing treat! Thanks so much for sponsoring this giveaway! As requested, signed up for the newsletter and find it distressing imported olive oils are not EVOO. “Our” government is making it so difficult for USA farmers yet the FDA allows the import of products USA producers would go to jail for should they employ the same methods. Disgraceful! In my household, only EVOO and butter are used on a daily basis. fyi there is no link to click as indicated in your instructions for chaffin family farms. also the other instructions within the widget do not appear to be running (or maybe that’s just my internet feed. Try again Ellen, the links are all there. Blessings. 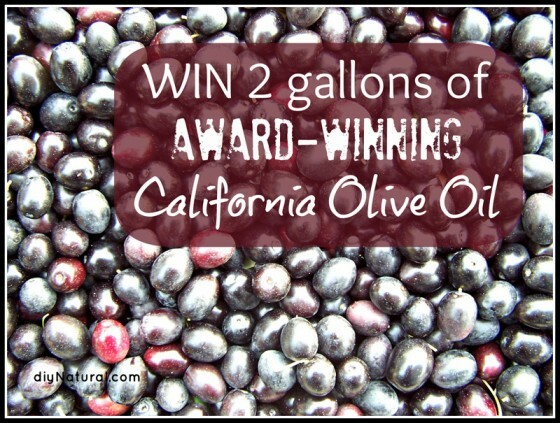 I would love to win this olive oil!! All I have ever used is the ones at the grocery store and they aren’t very good. It would be wonderful to try a good tasting oil that is from the U.S. Thank you!! I signed up for the newsletter!! I liked them on Facebook! I pinned them on Pinterest.